Debjani Ghosh, Intel’s Vice President, Sales and Marketing Group, and Managing Director, South Asia, is one of the region’s most prominent technology evangelists. Under her leadership, the Santa Clara, California-based chipmaker has evolved into a key strategic ally of the Indian government’s digital literacy and innovation programs. Ghosh says data-driven decision making is important because data busts myths about received wisdom. But more than ever, a culture of data thinking is critical for India because only data can help its growing battery of entrepreneurs learn from mistakes and build better companies. Below are edited excerpts from an interview, where Ghosh spoke to us about the challenge of making data-driven decisions and building digital literacy with the government in India. When you first came to India, you had told me that you were bewildered by the challenge of building digital literacy here. How much of that challenge have you grappled with using data, and how much was based on intuition? Intel is a data-driven company to the T. You won’t succeed in this company if you can’t work with data. When I came to India in 2012 and discovered that there just wasn’t enough data, I was lost for a while. I didn’t even have intuition when I first came, so I needed to work hard to even have a feeling in my gut! I spent a lot of time on the ground trying to understand customers firsthand, because that was the only way to figure out what I was dealing with. Even now, there’s a huge gap with respect to having the right data needed for decision making at the right time and in the right form. I’d say 60% of my decisions are based on intuition and 40% based on whatever data I can find. I guess in India, intuition is always going to be important. How have things changed in the last few years? These days in the IT industry, there’s enough data to get some key trends. The problem that we were trying to solve when I came here in 2012 and are still trying to solve is, why is technology adoption so low in India? That problem statement hasn’t changed. But now at least there’s enough data to tell you what’s working, what’s not working, and what people are doing with technology, which allows you to come up with new ways to look at the same old problem. The other thing is, as we go down to the grassroots level with programs like Ek Kadam Unnati Ki Aur (an initiative to digitize India’s villages), we are now stressing a lot on impact assessment. We make sure that whatever the data tells us benefits not just us but also our partners, the government, and everyone else involved. But I also still see a dangerous trend where people use the data that they want to use to justify whatever it is that they want to justify. That’s very self-serving. It really doesn’t help, especially if you are taking a business decision. I think we have to teach people not just to collect and present data but also to use data. Data doesn’t exist only to prove you are right. Frankly, one of the biggest benefits of data is to show you exactly where you are wrong! But it’s a hard mindset to change. How important is it to have like-minded partners when you want to change such hardened mindsets? And is collecting data still a challenge? Not so much. All of us reach the customer in so many different ways — social media, retail stores, our ground initiatives with the government, etc. So the data is coming in, but it’s just sitting there. We need to be able to mine it, listen to it. Those are the processes we have had to build. Two things about Intel’s use of data stand out: one, how it is using data to improve manufacturing processes. Two, how data is helping improve diversity, which is one of Intel’s major cultural pillars. Tell us a little bit about these two applications. Well the data analytics piece—Big Data—is a part and parcel of everyday life at Intel. The way we manage our business, the way we handle customers, everything is underpinned by data. Data is critical, and the best part is, it has become almost invisible—that’s when you know it’s really working, when you don’t have to pay separate attention to it. A few years back, we took the hard call to move to processes like Salesforce which would drive that discipline in everybody, and that has definitely helped a lot. Interesting that you brought up the diversity angle. You know that our CEO Brian Krzanich stands up at very public forums and talks about diversity, so he is a huge champion for the cause. We have set ourselves a very ambitious goal that we will have full representation by 2020. And that’s tough, given where the IT industry is today. But Brian, who is an engineer to the core, says if you have any problem, you need to have milestones, and you have to track to those milestones daily. If you don’t have milestones for something, don’t do it because you won’t be able to measure success or failure. I think that approach influences all of us in the company in whatever we do. Even for diversity we have well-defined milestones. For example, within Asia we have a board—and I am part of the board—that is tracking those milestones and constantly analyzing what we are doing right and what we could do better. That’s helped a lot. Last year we overshot our targets, and it’s great for the company. When you get more women in leadership positions, for instance, it makes a tremendous difference. Two of Intel’s big ongoing programs—National Digital Literacy Mission and Innovate for Digital India—are based on very ambitious, large-scale partnerships with the government. What are some of your key takeaways from working with the government? In the beginning I didn’t have too much expectation from the government. But I was always sure that in India there’s no way you can have large impact and scale without the government. MyGov and its CEO Gaurav Dwivedi [Intel’s key partner on the Innovate for Digital India program] have been absolutely fantastic, but so has every other department we have worked with, be it the Department of Science and Technology or the Common Service Centres. We have a lot of beliefs in our mind that things don’t work in the government, but our experience has been absolutely fabulous. Especially for Ek Kadam Unnati Ki Aur, now that’s a very difficult program. To go into villages and say, “This is good for you.” Not just convince them to come for the training but take ownership of the program, the center we have opened, and really use it—that’s a massive challenge because there are all kinds of social conventions and taboos. The government teams working with us on the ground were terrific there. I say this again and again: you cannot have a hidden agenda when you go into these initiatives with the government. You need to have a common cause. If they feel Intel is doing all this just to build its brand, of course they won’t go all out to help. And to build my brand I won’t go to them either. I will hire an agency. But if they figure out that Intel is interested in seeing how technology can be made to work best for our villages, why won’t they help? They want it just as badly as us. Is there a particular problem statement that you believe data professionals in India should look at? A lot of the data that is made available in India is post the fact. Sure, it’s helpful in identifying trends, but it has its limitations. Very little work is being done on forecasting or predictions. If companies like SocialCops can help bridge that gap, that’d be wonderful. Also, there are tons of initiatives that have been announced under the Digital India program. 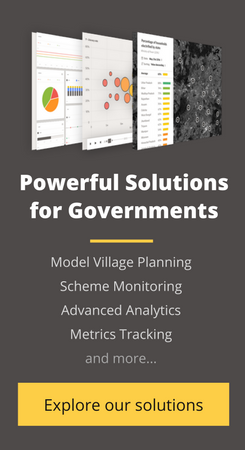 Why not help the government get authentic data and figure out how these initiatives are panning out? Given its ambitions, I am sure the government would like to know what’s going well and what’s not. What are some of the big assumptions that you think will be dismantled as India becomes more data-driven? The guy at the top is always right—I think that’s a very dangerous mindset that’ll have to go. In India, we hero worship too much. Things that we used to take for granted — brand loyalty, predictability — have all vanished. [In this environment] it is simply not true that the “boss” knows it all. Data should lead the process of changing this mindset. It’s like the change that is happening in education. The teacher used to know it all. Now the teacher and the learner learn together. The same thing will happen with the government and corporates in the age of data. I think the other thing that the culture of data usage is going to do is make it easier to deal with failure. We as a country struggle tremendously with this. Now with India moving to the culture of entrepreneurship, you have to fail. I think where data becomes important is that helps with course correction. It makes entrepreneurs learn from their mistakes and build better companies. Tanmoy is a freelance journalist and visiting faculty at the Vedica Scholars Programme for Women based in New Delhi. He is passionate about building future-proof organizations and is writing a book on startups soon to be published by HarperCollins India. He tweets at @toymango.